The Newton Home Group is owned and operated by Jack and Kristene Newton. They are a husband and wife team brokered by The Associates Realty located at The Star and are committed to helping their clients receive the BEST in quality real estate care. Kristene has been in the real estate business for over 13 years, first as an Affiliate Broker for a developer in Nashville, TN then moving forward to the DFW area as a Stager/Re-designer before they decided to team up and start The Newton Home Group, LLC. The Newton Home Group and business partnership with Vacation The Right Way landed the company on HGTV network. Kristene’s redesign work was first featured on ‘Island Life’ in 2016, then a second project on a beautiful remodel in South Padre, TX landed The Newton Home Group on HGTV’s ‘Beachfront Bargain Hunt’ in 2017. 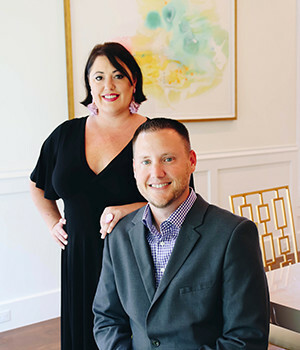 Jack and Kristene are passionate about helping their clients and want to help make the process smooth when it comes to real estate transactions. Great business partnerships are key in helping provide their clients with successfully buying, selling, and investing in residential and commercial properties. Contact us today to see how we can help you! “Jack helped us purchase our first home! I couldn’t have asked for a better realtor! Very responsive and so helpful!” – Allison K.
“Thanks guys for putting up with my 10,000 questions every other day and helping us find that perfect home! We love it!! !” – Jerrod W.
“LOVED LOVED LOVED working with this group!! Genuine people and excellent service. I was so stressed out with this move I couldn’t think straight half the time. Kristene jumped right in and helped me get organized. Not only that, she staged my whole house. Amazing work!! I couldn’t have got through this process without them. I would recommend to anyone buying, selling, or staging/decorating.” – Melissa H.
“We originally listed our home FSBO. We had minimal or unqualified traffic coming in for tours. After listing with #thenewtonhomegroup we literally had 8-9 scheduled viewings in 5 days, a contract within 2 weeks and we closed soon after (on our terms). Whether your searching for a forever home or temporary home, let Jack and kristene handle it for you. They will literally blow your mind with customer service and professionalism.” – Meghan T.